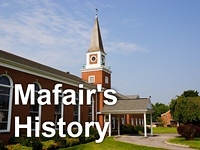 Mafair UMC: Gadgets & Gizmos - Mafair's 2017 Vacation Bible School! Gadgets & Gizmos - Mafair's 2017 Vacation Bible School! Who's ready for VBS? We are! Join us at Mafair UMC this summer for Gadgets & Gizmos, a brand new VBS curriculum for 2017 that's sure to please your little ones while showing them the Love of God. We'll have activities for kids aged 3 years to rising 6th graders (kids who finished 5th grade in May). Free snack supper is included! Questions? Give our Children's Director, Liz Yount, a shout at lyount@mafairumc.org.